UW Bioengineering’s Professor Paul Yager has been elected as a 2017 National Academy of Inventors (NAI) Fellow. Dr. Yager and other 2017 NAI Fellows will be inducted on April 5, 2018 at the Seventh Annual Conference of the National Academy of Inventors at the Mayflower Park Hotel in Washington, D.C.
With Dr. Yager’s election, BioE now has 2 NAI Fellows. The department’s first Fellow, Robert F. Rushmer Professor Suzie Pun, was elected in 2015. Dr. Yager develops two-dimensional paper networks (2DPNs) for diagnosing disease, with the long-term goal of increasing access to healthcare in developed and developing countries. His projects involve collaborations with non-governmental organizations, federal agencies and industry. His multi-disciplinary work draws from diverse disciplines including physical biochemistry, chemical engineering, materials science, electrical engineering, biomedical imaging and computational fluid dynamics. In 2005, Dr. Yager received a $15.4 million Grand Challenges grant from the Bill and Melinda Gates Foundation to create a portable, rugged and cheap tool for testing blood to diagnose disease that could be used in developing countries. 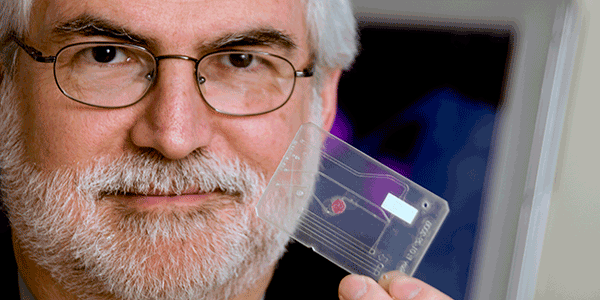 His current work to develop diagnostic devices to detect MRSA and influenza is supported by NIH and DARPA. Election to NAI Fellow status is the highest professional accolade bestowed soley to academic inventors who have demonstrated a prolific spirit of innovation in creating or facilitating outstanding inventions that have made a tangible impact on quality of life, economic development, and welfare of society. The NAI is a 501(c)(3) non-profit member organization comprised of U.S. and international universities, and government and nonprofit research institutions. The organization was founded in 2010 to recognize and encourage inventors with patents issued by the U.S. and Trademark Office, enhance the visibility of academic technology and innovation, encourage the disclosure of intellectual property, educate and mentor innovative students and translate the inventions of its members to benefit society.